The mobile packs a 3,400mah non removable Li-Ion battery, with quick charge support. It is with such support, that the smartphone can easily last up to 2 days with a single boost. As per the claims, it can deliver a standby time of 723 hours and a talk time of up to 19 hours. Elegantly, the smartphone comes with a 6-inch full-HD + (1080 x 2160) IPS LCD display with an 18:9 aspect ratio, Corning Gorilla Glass and a peak brightness rating of 500-nits. Last not the least there is a dual camera setup at the back capable of 2X optical zoom with a dual-tone LED flash and Zeiss optics(optical and optoelectronic technology company that makes high quality optics and lenses). The primary 12-megapixel wide-angle sensor has an aperture of f/1.75 and a pixel size of 1.4 microns. The secondary 13-megapixel sensor has an aperture of f/2.6 and a pixel size of 1 microns. These detailed features is going to come as a eye candy for Nokia lovers. Nokia 7 Plus is launched in India. The phone was recently leaked with images suggesting about sporting a taller 18:9 aspect ratio display, with a 2.5D glass on top. It is powered by Qualcomm Snapdragon 660 chipset coupled with 4GB RAM and 64GB storage. Further, Nokia 7 might also feature a dual camera with 12MP + 13MP sensor at the back with zeiss lens and dual LED flash and a 16MP front camera setup. The device is rumoured to be powered by a 3000mAh battery, and is accompanied by a quick charge support and a USB Type-C port. There is also a fingerprint sensor below the camera module. Nokia 7 might be available in Gloss Black and Matte White. The smartphone comes with a 6.0 inches Capacitive Touchscreen display with a screen resolution of 1080 x 1920 pixels, with Corning Gorilla Glass. It is powered by an octa core Qualcomm Snapdragon 660 processor clubbed with 4GB of RAM and 64GB internal storage. The storage can be further expanded up to 128GB via a microSD card. The rear camera comes with dual cameras of 13-megapixel and 12-megapixel. Switch to the front camera and you get a 16-megapixel that might come with several effects. As per the reports, it includes wi-fi 802.11 a/b/g/n/ac, wi-fi direct, hotspot, v5.0, USB Type-C, with A-GPS, GLONASS, BDS. There is also hybrid dual sim (nano + nano/microSD) available. It packs a 3,800mah non removable li on battery, with quick charge support. The images reveal that the phone will run Google's Android One out-of-the-box. Nokia 7 Plus price in India might start from INR 25,999 for the 4GB and 64GB variant. Nokia 7 Plus latest update makes the device more secure for end-users. The new update for the Nokia 7 Plus is available for all the devices in India and Sri Lanka and it is expected that the update will make its way to the other regions soon. 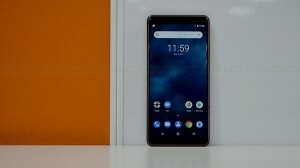 Nokia 7 Plus Android Pie Beta receives Digital Wellbeing app. Nokia 7 Plus has received the Digital Wellbeing app following the Play Store update. Nokia teases the launch of a gaming smartphone in India: An Android N-Gage? HMD Global starts rolling out Android Pie Beta 4.1 update for Nokia 7 Plus. The update has also brought the September security patch.